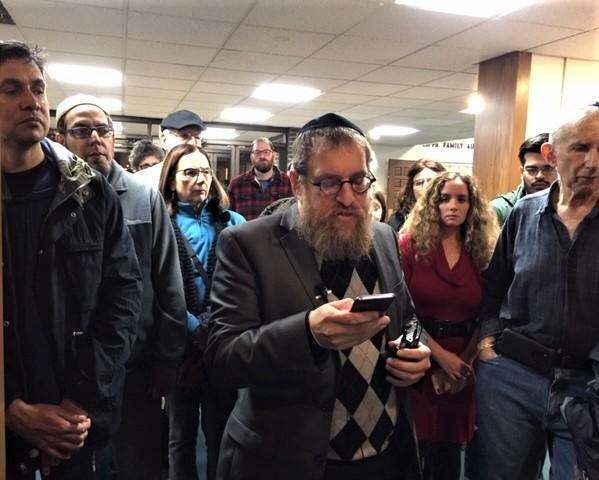 With prayer in a variety of languages and a variety of religious traditions, community members across western New York mourned the 11 people murdered in a Pittsburgh synagogue Saturday morning. On a dark and rainy night at Temple Beth Tzedek Sunday night, people gathered for comfort and religious consolation in prayer and preaching. 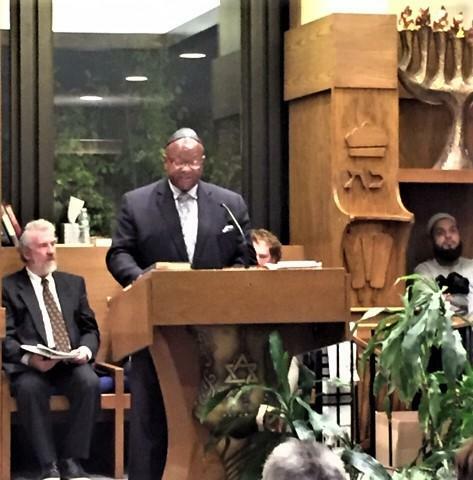 An overflow crowd was in the sanctuary to hear Cantor Irwin Gelman deliver that memorial prayer, including the names of the 11 people murdered at the Tree of Life synagogue. Temple Rabbi Samuel Barth said violence like this is forcing life away from the questions of religion. "Those should be the questions that exercise us here," Barth said, "and not, 'Have we done the right active shooter drills? Have we taken sufficient care of the security of our buildings?' Those have become our questions." "Though I walk in the Valley of the Shadow of Death, I fear no harm because You are at my side," read NAACP President Rev. Mark Blue from the 23rd Psalm. 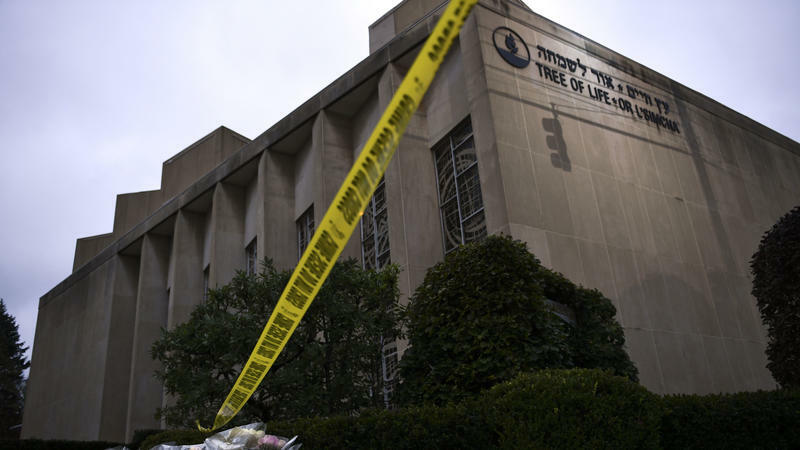 While the focus was on the synagogue victims, other religious groups saw it as an attack on the wider community, as many of their religions have been attacked and members murdered over the years. Manjit Leo Singh was there because of attacks on fellow Sikhs. "Life is about community. Life is about sharing and being with people," Singh said. "When things are well, we share. When things are hard, we share. We pick each other up. We look around and we help." Rev. George Nicholas said there must be truth and power. "We have power. All of us in our faith traditions, whether we be Christians, Muslims or Jews, we are believers in God. We believe that God gives up power," Nicolas said. "Power for what? Power to bring forth the beloved community that Dr. King talked about." The traditional Kaddish prayer for the dead was almost the last element of the "hope and healing" service. As the packed house left the service, there remained the lit candles in memory of those killed in Pittsburgh and those killed in other places, at other times. This is one of the last services at the temple, with a new synagogue opening on North Forest Road in a week. WNY Muslims also released a statement condemning the attack. "WNY Muslims condemns the attack on the Synagogue in Pittsburgh, Pennsylvania, in the strongest possible terms and stand by the American Jewish community at this time of hurt and anguish....As Americans, as people of the Book, and as human beings, we must come together in times like these, when divisive rhetoric has become so popular, and hate-linked crimes are on the rise. WNY Muslims calls for everyone to open their hearts and minds to people who look, think, or worship differently than you do, and to recognize the worth of their human souls." Gov. Andrew Cuomo directed that flags on all state government buildings be flown at half-staff Monday until sunset on Sunday in honor of the shooting victims and "issued a call for peace and civility following a week of horrific shootings and attempted bombings." I'm Lakshmi Singh, stepping in for Michel Martin with an update from NPR White House correspondent Tamara Keith. She has been monitoring the Trump administration's response to the shooting at the Tree of Life Synagogue in Pittsburgh today. Good evening, Tam.